Even though the basketball lovers and fans expected it to watch the derby game of the Belgrade Trophy tournament, it turned out to be an easy piece for the Serbians who totally overplayed Greek team. The final score was 93 – 61 (+32). The Greeks opened the match. 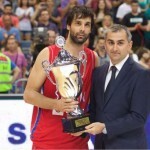 Pappas tried to end up when was blocked but after Bogdan Bogdanovic missed the basket Olympiakos player Georgios Printezis, captain of the guest team pointed. After Papanikolaou stole the ball Jovic made his first fault and right after him Vladimir Lucic faulted Georgios Printezis. Tough fight with many contacts was seen, but eventually Serbia got the ball so Ognjen Kuzmic, the new Madrid center, made a mini show by dunking over Greek defense for fist points for Serbia (2 – 2). Stefan Bircevic added 2 points right after for the first lead of the hosts. Another one amazing steal for Serbia used by amazing playmaker Stefan Jovic, that pushed Greek players making more faults. Greek defense couldn’t stop Serbian big man Boban Marjanovic who made both free shots, and two more from the game for Serbia’s 13 – 6 lead. Vasilijee Micic enrolled another free shots to secure 6 points lead for the hosts. Marko Guduric, the new player of Fenerbahce, didn’t have success with the lay-up, but Bobi Marjanovic was at the right place and corrected it immediately, what Bourousis followed on the other side of the court. The first quarter final is stamped with very fast play on the both sides, that finally ended with a big 23 – 15 for Serbia. Big show time and very far three shot scoring for the new Munich player Milan Macvan. It seems like it was “the green light” for Serbian wizard Bogdanovic Bogdan, that couldn’t help but continue sipping it. He raised up the temperature in Aleksaandar Nikolic venue with two triplles in the row. Serbia showed the real power that didn’t let host move from the 1st quarter score. Finally they stepped out from 15 points after whole 5 minutes silence when Pappas put in one free shot. The silence on the guests side, one more time, was broken by the captain Georgios Printezis from the free shots line. The second half show-time opened up nobody else but Bogdan Bogdanovi himself. Bourousis, who will be playing in China league next season, replied with two points for the 50 – 24. Nervous Greeks couldn’t stop amazing Serbian offense, but no more luck had in reaching the basket when even tried with few faults and bring in play with the contacts in offense. Nothing much changed during the 4th quarter and beside amazing Serbian defense we couldn’t see so much from the Greek team. But for certain more triple-showers from Bogdan Bogdanovic, the newest NBA member. Exactly him is the player who had the best index rating of 21 (MVP of the game), with 14 points and two steals. Vladimir Lucic and Boban Marjanovic followed with 16 and 15 (index rating). 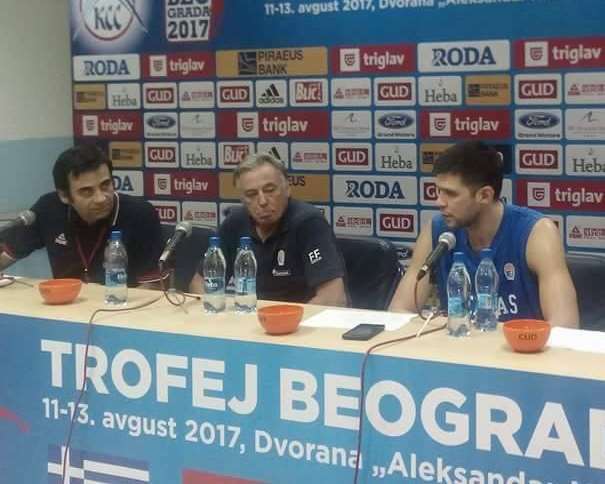 During the press conference Aleksandar Djordjevic, coach of Serbia, said that he is not satisfied at all with the presented by his players: “We have to bee realistic, Greece played last night the tight game with Montenegro and must be they are feeling the consequences and are still tired”. The easy win didn’t fool Djordjevic, as they still consider Greece as one of the potencial candidates for the medal: “No team has played their cards yet, neither is Greece. But that shouldn’t be minded by us, as we have to take care of our grass, and to see what we got”. Tonight Milos Teodosic, Nemanja Nedovic, Miroslav Raduljica and Marko Simonovic were out. Tomorrow is the last day of the tournament and Serbia will face with team of Montenegro. 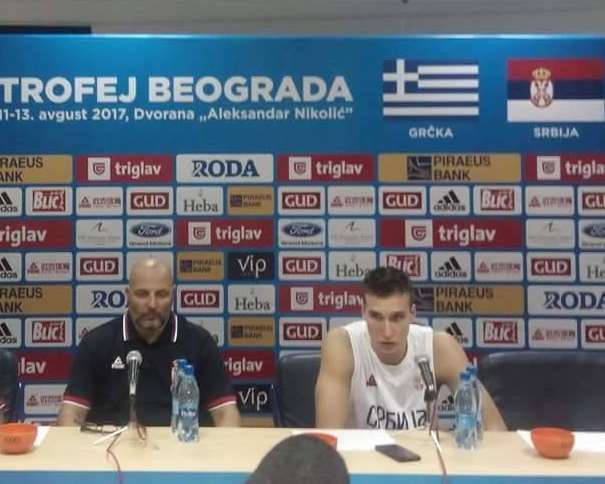 The game is scheduled for 9 p.m. and coach Aleksandar Djordjevic, so as Bogdan Bogdanovic, both invited people to come to Aleksandar Nikolic hall to support the team (Montenegro was previosly defeated by Greek team at the first day of the tournament).